BRYAN BAYLIS, has had a long and satisfying professional career in the financial sector. After passing matric in 1957, Baylis' early career was spent in Heinz J Betz & Co in Port Elizabeth, where he completed his articles from 1958 to 1962. Baylis studied through UNISA and qualified as a chartered accountant in 1962. He then joined PricewaterhouseCoopers in 1963, where he spent time working at the Port Elizabeth, Durban and Johannesburg offices. This was followed by a move to George McKeurtan Son and Crosoer (a predecessor firm to Ernst & Young) in Durban in 1968, where he was made partner in 1971. 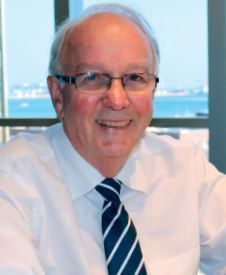 His career at Ernst & Young saw him relocating to Port Elizabeth in 1972 to open an office to serve national clients. In 1981, Baylis was transferred back to Durban as an audit partner and he then became the senior partner for the last year before his retirement in 2001. At his retirement lunch from Ernst and Young, Baylis was asked by MSC Chairman, Captain Salvatore Sarno, to join the shipping company to take over the position as financial director from Bob Winter, who was about to retire. As Baylis had been the audit partner of MSC since 1979, he was happy to accept the position. Baylis says, "I accepted and I thought that it would be for five years. Now over 15 years later, I am about to retire from MSC at the end of 2017." Baylis is justly proud of his stay at the shipping line and has thoroughly enjoyed the 'very positive experience'. His working career at MSC, which is the second biggest shipping line in the world, has been encompassed by much job satisfaction. He says, "As the financial director, I have been involved in everything and know what is happening in all aspects of the company." An important feature of his experience has been in the continued positive approach of the company to its business operations, which has ensured that they have been able to ride out the economic downturns. "From the financial side the company has always met its commitments positively and has been hugely successful. A current challenge is in the volatile South African economy, which impacts on the rand dollar exchange rate. As a shipping company, it is impossible to control for such fluctuations and making financial decisions is difficult," says Baylis. However, he says that over the years the shipping line has continued to look ahead and has had the foresight to grow its operations. Baylis commented that the leadership of Captain Salvatore Sarno, the Chairman of MSC South Africa, and Mr Gianluigi Aponte, who is the Group Executive Chairman of MSC - SA in Geneva has led to the growth in South Africa. MSC now comprises 20 companies, which include amongst others, logistics, depots and shipping agencies, which all operate very smoothly. Over the years, an ongoing highlight experienced by Baylis has been in MSC's family approach to running its business. He commented that not only are the employees looked after well, but there is a working ethos of mutual appreciation, which ensures for a very harmonious environment, where everyone is involved in the company's operational success. Baylis commented, "I enjoy being one with people and I have found this aspect to be very rewarding." Baylis has also much appreciated the many community interventions that the company is involved in such as its learnership programmes, Sailing Foundation in Simonstown and involvement in development sailing regattas in Durban. He has also been ensuring that the company will not be disadvantaged by his upcoming retirement by mentoring his successor. He says, "I enjoy growing and training other employees. I have always had a philosophy of imparting knowledge, which has been gained over many years of experience." He believes that in contrast to today's trends of job hopping, his long stays within his various positions have been very valuable. He added, "It is good to stay and grow with a company. The opportunities are there if you look for them." When not at work, Baylis is kept busy spending time with his eight grandchildren and is a committed elder of the Glenwood Presbyterian Church in Durban. He is looking forward to his retirement but will be on hand to offer assistance if required.